Oh baby! Let any parents-to-be feel extra special with this sweet gender neutral baby shower 'Woodland' theme idea using FolkArt and Mod Podge to make these seven budget-friendly DIYs! Baby Shower Mason Jar Favors: Painted mason jars are not only inexpensive, but add a rustic vibe. Fill with treats or flowers for a favor they'll want to keep! DIY Baby Shower Serving Plate: Decoupage wood grain paper on the back of a glass plate to pull it all together. Table Runner: We use the FolkArt® Handmade Charlotte Woodland Stencil Set to easily add flair to a plain table runner! Bunny Centerpiece: Scour thrift stores or yard sales for animal statues - they're easy to repaint with no-prep FolkArt Home Decor Chalk. Tree Stump Cake Stand: We adore the texture and visual interest of wood. For this piece, we use a Craft Essentials™ 3” birch pillar for the base. DIY Mini Gift Bags: These little bags can get expensive - we love the idea of making your own. Baby Shower Banner: This cute banner helps to set the stage and makes a great photo backdrop! Add burlap and fresh flowers to the tablescape, and you're ready to welcome baby! 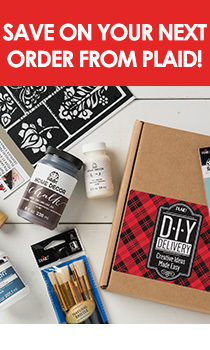 Sign up for the Plaid Newsletter for more DIY inspiration.